As many of you know, my whole belief and the foundation of the PowerSkating Academy’s methodology is all about long-term development. Long-term development is not only about developing foundation and skills through progressions, but it is also about working on the mental and emotional development of an athlete. Investing a lot of time and money to create a great young player, but have them lose their passion towards the sport by the age of 14 has really accomplished nothing. My analogy of this is studying to get a 100% in grade six, but losing interest and quitting school by grade 8. The long-term development model must take into consideration age, amount of sport and non-sport specific training, mental work load, emotional and physical commitment to competing and performing. The hardest aspect of this LTD model is creating a great athlete while also creating a great human that loves what they do. The following excerpts from Josh Levine’s article, ‘Early Specialization and Year-Round Training is Destroying Youth Hockey’, are completely aligned with my beliefs. The article lays out some great thoughts about early specialization and over training and points out some important ideas that I have been preaching to our longtime clients. 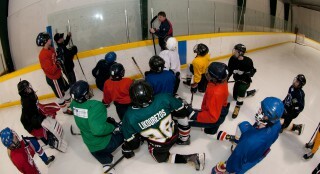 “The first major problem with specializing in hockey too early is that practice makes permanent, not perfect. (Levine)” A common problem with youth hockey is continuous repetition of unfocussed and uncorrected practice. My solution – our slow and perfect methodology. “Year-round training schedules also cause fatigue as young athletes aren’t given proper rest and recovery periods. As a result of the constant practice, many young players develop short, choppy and more upright strides. Some parents have even asked me how their player could possibly seem to be getting worse at skating when they are doing skating clinics, AAA programs and off-ice training regimens all at the same time! (Levine)” I have two responses to this. More is not always better. More is only better, if the quality of the ‘more’ is better. Younger kids are not always emotionally or mentally ready for more commitment to a sport and its training. This can lead to early burnout. I highly recommend reading articles similar to this, from highly reputable authors that work with pros and elite athletes in the highest levels of hockey. Remember that the race to greatness is not a sprint, it is a marathon!